Light: Acknowledging loss and moving on. Focusing on how the glass remains “half-full.” Finding the silver lining in a dark cloud. Recognizing that loss is a natural part of life. Embracing healthy grief. Learning lessons from harsh consequences. Shadow: Wallowing in unhealthy grief or self-pity. Refusing to move on and let go. Clinging to the past. Obsessing on past lives and past loves. Failing to live in the present. Beating yourself up over past mistakes. Allowing fear of failure to limit your efforts. Story: Shocked by loss, the Main Character considers giving up the quest. Alternatively, the Main Character’s judgment is distorted by memories of loss. Relationships. Maintaining an affair with memories of past lovers will prevent you from appreciating lovers in the here and now. Burned by past friends or partners? Thank them for the lesson learned and offer your heart to those who deserve your affection. Work. You can’t look back. The “good old days” have given way to the “here and now,” and it’s time to adjust your efforts accordingly. If you made mistakes, admit them, pick up the pieces, and return to work with renewed effort. Don’t focus on losses; define new goals. Spirituality. Your faith, at first, may seem like “cold comfort” in times of loss. But if you accept that all things unfold according to a larger pattern, you must look for the role this loss plays in the grand scheme of things. Three cups remain upright. What do you still have to be thankful for? Personal Growth. Perspective is everything. Each of us is predisposed to focus on the positive or the negative; if you tend toward the latter, condition yourself to be more optimistic by reviewing how apparently dark events of the past gave rise to greater strength or insight. Fortune Telling. A breakup looms. Don’t cry over spilt milk. Take your lumps and get back in the saddle. When? Between October 23rd and November 1st. Three Cups Down, Two Cups Up. Tradition leads many artists to draw this card with three Cups overturned and two still standing. The outcome (three) of your emotional or spiritual effort may be disappointing, but now it’s time to focus on achieving a new sense of unity (two) elsewhere. The Posture of Defeat. 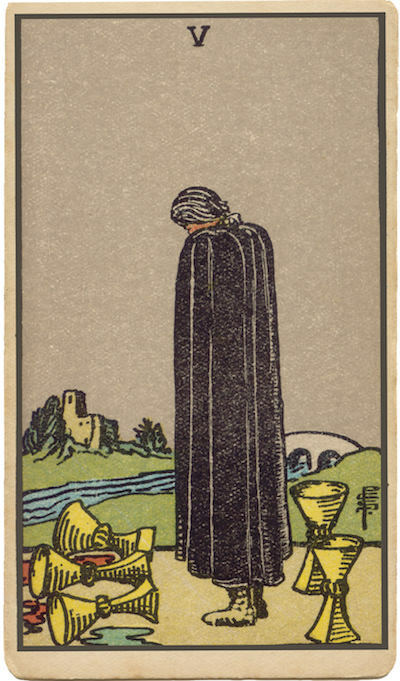 This card often depicts a cloaked figure with slumped shoulders. How is your current mood reflected in your posture? If your demeanor changed, might your mood change along with it? Weighing Options. Do you focus on loss, or on the opportunity inherent in change? Do you grieve for the way things were … or do you reassess your situation and adapt to it? How might this insight help you in your own situation? The Marseilles Image. Growth continues (loss forces growth! ), but the garden’s getting cramped. How can you balance the need for emotional stability with the fact that time is marching on? How do I tend to deal with loss? What life lesson might I be learning now? How can I shift my attention from the past to the future?